Which Raspberry Pi board support ARM v8A (AArch64) Architecture, is there any board with core as ARM A53 and AArch64 support. The Raspberry Pi 2B v1.2 / 3B / 3B+ / 3A+ SBCs, all use the BCM2837 Cortex-A53 (ARMv8) 64-bit SoC. According to the link below from ARM, it says "The only real drawback is the current user space of Raspbian is AArch32 and not AArch64." Raspbian doesn't support AArch64, can we get support to install AArch64 kernel in the raspberry pi board? There are other distributions now, but I am happy with the Gentoo64 version. There are 64-bit OSes available for the Pi 3 (and the Pi 2 v1.2 which uses the same SoC as the 3B). I have not tried Gentoo64 because I have no spare microSD cards or USB sticks large enough, but those who have tried it have reported good performance. I've made my own Debian and Ubuntu ARM64 images in the past. 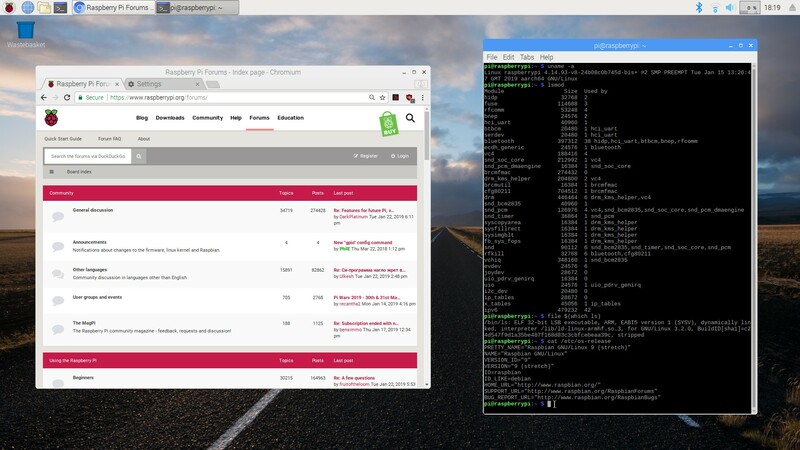 In fact, I'm currently working on a Debian image which uses u-boot, GRUB2, and the generic ARM64 kernel to boot. The problem with having Raspbian go to 64 bit is that it would mean that either the RPF would have to support two versions (which would be expensive), or it would break compatibility older Pi and the current Pi0/Pi0W. Besides trying to find a way to move the Pi0/Pi0W to a 64-bit capable SoC (and if you know of a way to do that with increasing the cost...do tell), the CM1 is promised to stay available until at least 2023. So no matter what, 32-bit Raspbian has to be around at least that long. what userland OS you then want to run on top of it. Due to the ARMv8a architecture (of RPi3B, B+ etc. ), when booted under a 64-bit kernel, both 32-bit and 64-bit userland subsystems can be (natively) used, but when booted under a 32-bit kernel, only 32-bit userland is allowed . most things however (WiFi, Bluetooth, I2C etc.) still work just fine in a 64/32 scenario. The RPF maintain their own custom Linux source tree (here), which contains a number of not-yet-upstreamed elements (although these are decreasing over time). You need to build your kernel using (an appropriate branch of) this source tree for maximum compatibility with the hardware. If you are interested in this, I maintain (for my gentoo-on-rpi3-64bit project, but entirely usable for other distros) a weekly autobuild (aka 'bot-build') of the current default branch (at time of writing, rpi-4.14.y) of said RPF kernel, configured using a vanilla bcmrpi3_defconfig, here. And another, using a slightly tweaked version of that defconfig, here. There is no need to back up the 32-bit kernel itself, nor its modules, as the names of these will not clash with their 64-bit counterparts. a matching module set into /lib/modules/<kernel release name>. Other than the DTBs, none of these will be present in the baseline 32-bit Raspbian image you have just installed. That's it! You now have a 64-bit kernel (and corresponding module set) installed, and your RPi3 will automatically try to use in preference to the (Raspbian-supplied) 32-bit kernel, where present. So next, reboot your RPi3. With luck, you should find it now starts up into the 64-bit kernel, and then continues into (32-bit userland, vanilla) Raspbian, just as before! You may see the message "dmi: Firmware registration failed." displayed during early boot. This may safely be ignored. Verify that your WiFi, Bluetooth etc. all work as before (they should do); try opening the bundled (32-bit) Chromium web browser and so forth. Notice how the kernel ("uname -a") is aarch64, the vc4 driver module is loaded, and the userland (as shown, for example, by the "file $(which ls)" command) is aarch32. Raspbian itself is 32-bit only (although jdonald has published scripts to migrate it to multilib, for those of sufficient Debian-fu). However, there are many other 64-bit (and multilib) distros available for the RPi3, including Debian, Gentoo, various flavours of Ubuntu, Arch etc. These generally come as community-supported bootable images (from contributors like Crazyhead, code_exec, the occasional Gentoo reprobate ^-^ and many others) which include an appropriate 64-bit kernel (as just discussed) plus configured userland. You can browse this thread and this forum to get an idea of what's available - there are quite a few choices! access files from the 'pi' user's home directory. In any event, the good thing is, it's easy to try various images, and see which one suits you best. Or rather, to be completely technically correct, you could run a 64-bit hypervisor (e.g. KVM) and then run both 64-bit and 32-bit kernels on top of this, with either 64 or 32 bit userland(s) on the 64-bit kernel(s), and 32 bit userland(s) (only) on the 32-bit kernel(s), but that's an advanced point. 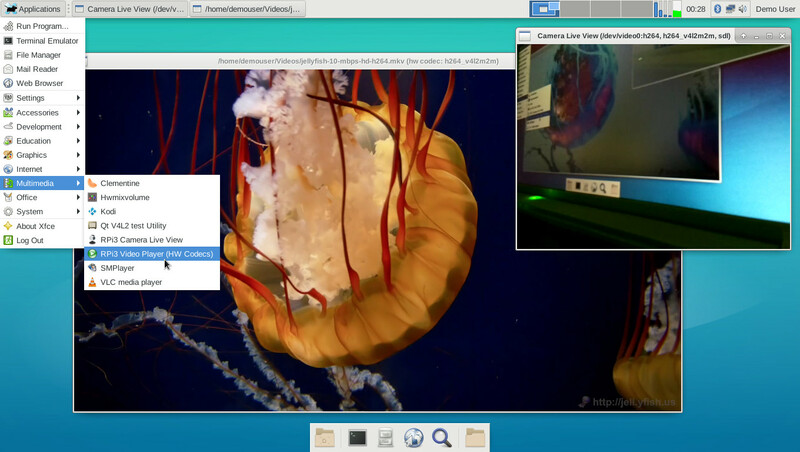 For details on running a 64-bit QEMU KVM hypervisor on the RPi3, please see my notes here and here. For OS in the above, read kernel, for app, read userland (including the userland OS). It is relatively straightforward to compile your own kernel if you want to. See e.g. these notes. Gentoo users may also be interested in my own cross-compilation notes, here. Probably a silly question, but will 32bit baremetal code run? Not scared of breaking things now, I have a SSD based Gentoo64, leaves me with lots of uSD's to use to try all this. Running ARM32 programs against an ARM64 kernel is possible. However, you may want to use a chroot to install and run these programs under. There are multiple ways to setup a chroot. One way is to start with an Ubuntu prebuilt filesystem. Download the filesystem, extract it into a folder, mount your /proc, /dev, /dev/pts, and /sys folders into the filesystem, copy over your resolv.conf, and chroot in! 64 bit kernel under a 32 bit raspbian is working fine for me, and I'm in the process of fixing up the bits of the kernel that don't work. All the Mmal and IL apps I've tried still work with that, as the buffers passed from the 32bit app still map correctly onto the Gpu versions of those structures. The 32 bit mmal/IL framework stuff in userspace make the correct mappings for transferring data. (The one bit that really doesn't work at the moment is mmal zero copy as the vcsm driver doesn't work on aarch64). Build a 64 bit userspace version of those framework libraries and I'd expect it to fail. Codec support is now available on 4.19 via v4l2 as well as mmal/IL, and that does support both 32 and 64 bit apps (once I've merged the last couple of patches). 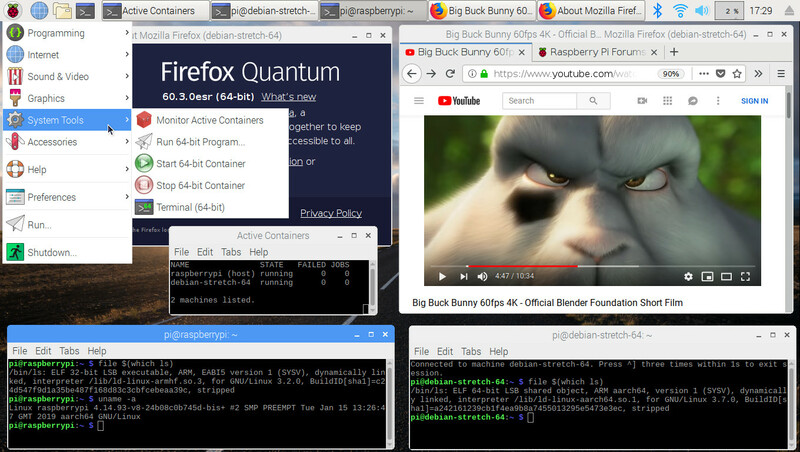 Gstreamer and ffmpeg both work fine with it. Ouch, mouse, keyboard going to be an issue or is it just highspeed USB? Anyway, it sounds like it is getting closer. fiq (arm's fast interrupt handler), but this has been deprecated in aarch64 linux. When did that happen? Between 4.14 and 4.19? I have not tried any eyecams in any aarch64 yet. Mouse and keyboard have been fine in my testing, only high speed stuff. I haven't heard of other significant complaints other than https://github.com/raspberrypi/linux/issues/2817 where USB sound cards also misbehaved (the initially reported wifi dongle is not supportable in either 32 or 64 bit on the Pi due to too many endpoints). I'm not the expert (jdb is), so I'm only relaying information I've gleaned from him. Apparently it was partially deprecated on ARMv7 too, but still functional. Oh, I will add that I know the Fake KMS driver is broken at the moment on 4.19. It's on my list of things to look at. The defconfig file hasn't been updated yet either, so most of the features are currently hidden. 64 bit kernel under a 32 bit raspbian is working fine for me, and I'm in the process of fixing up the bits of the kernel that don't work. All the Mmal and IL apps I've tried still work with that, as the buffers passed from the 32bit app still map correctly onto the Gpu versions of those structures. The 32 bit mmal/IL framework stuff in userspace make the correct mappings for transferring data. This sounds like pretty big news. omxplayer -no-osd and vlc --vout=mmal_vout are working with accelerated video too? chromium-browser can play YouTube videos without spewing MMAL errors? As I understand it the FIQ stuff was specific to the default dwc_otg driver. Could this mean that in aarch64 mode dtoverlay=dwc2 performs just as well or perhaps better in comparison? Please see https://www.raspberrypi.org/forums/view ... 9&t=232684 for ongoing support on this. I'm going to try and contain information to there rather than duplicate it around all the threads discussing 64bit kernels. NB I'm on Raspbian Buster (a test image), and I'm using Full KMS. Legacy appears to be OK booting to console, but fails to startx. omxplayer requires Fake KMS or Legacy. Legacy booted to a console it works fine. vlc mmal_vout requires Fake KMS or Legacy, therefore I'm unable to test. My vlc is also the stock Debian Buster version, so I can't test the version which includes our custom hardware acceleration. At some point I'll see if it works. Chromium is working in Full KMS. Video playback from iPlayer seems better than from Youtube. It's using a hybrid decode path rendering to EGL that seems to be struggling on the render. Up to about a quarter of the screen works pretty well, more than that gets jerky. Possible but I suspect unlikely. I'm more than happy to be proven wrong should someone else test it. The USB peripheral requires very fast interrupt handling, and neither driver is going to provide that. At least the dwc_otg driver attempts to prioritise things. Once I've cleared up some of the other issues I may discuss with our USB expert more on where the problems actually lie and whether there is any reasonable way of fixing them. For further details, please see this post.